My husband just informed me that he was not aware that today was Thursday already. Isn't that just the greatest feeling? Thinking it's Tuesday........Wednesday at the latest and finding out that in fact it's not just Thursday, but Thursday night! Since it is Thursday night, that brings us just about another week closer to Christmas......oh boy. 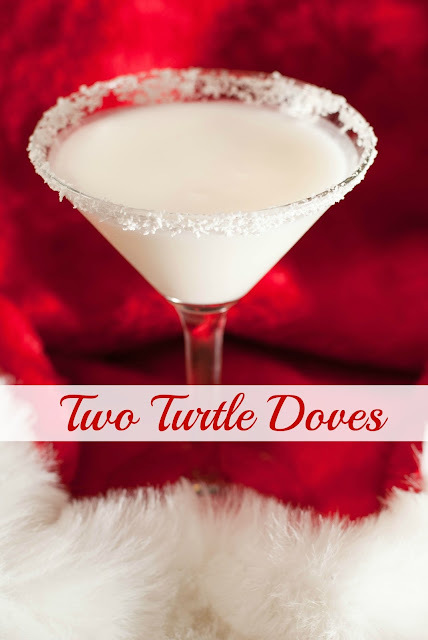 Right from the Christmas carol itself comes tonight's cocktail, Two Turtle Doves.....OK, so I really found tonight's cocktail at cocktailtimes. This cocktail is pretty good. Not a whole lot of wonderful flavor.......I'm assuming that is because of all of the half and half that is in this cocktail. 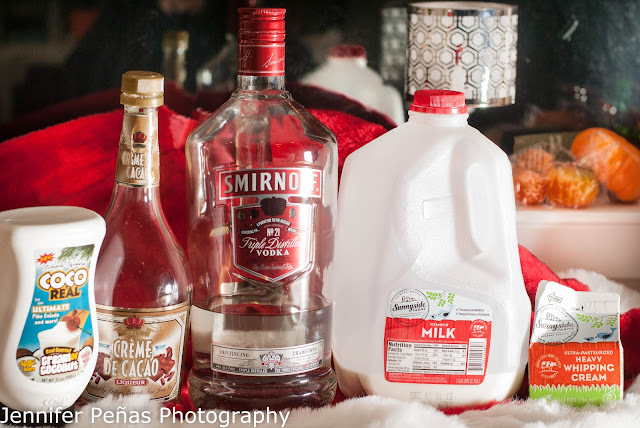 I think I would change the vodka to vanilla vodka instead of using regular vodka if I make this one again. All in all, it's not a bad cocktail....just not a very memorable one either. I must say that the grated white chocolate on the rim on this martini glass does add a very nice touch! I found this package of it at my local grocery store, and when I opened it up (thinking it was a big old hunk of chocolate I'd have to break up myself), I was VERY pleasantly surprised to see rectangles of white chocolate all separated in little plastic cup things (kind of looked like an ice cube tray). Rim your martini glass with grated white chocolate. In a shaker, add ice and all of the ingredients above, except for the grated white chocolate that you used to rim your martini glass. Shake and strain your cocktail into your rimmed martini glass. Here's to yummy white chocolate rimmed cocktails! 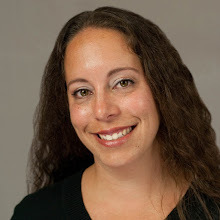 Hi Debbie! Great question. I usually use water to rim my glasses. On occasion I use chocolate syrup depending on the cocktail. Others use simple syrup as well, but I like to use water. It works well and makes me think that I'm having less calories/sugars, lol.